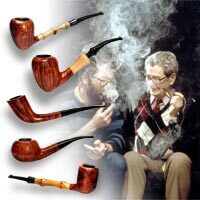 The Grand Old Man of Danish Pipe Making died in the Spring of 2001. Denmark is a small country with only 5 million people. Why has this small country become one of the metropols of the pipe World? One of the reasons was definitely Sixten Ivarsson and his new and creative work. 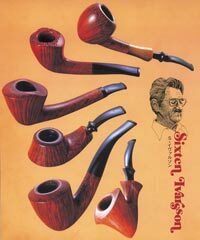 Pipes & Tobaccos has previously had a short article about Sixten Ivarsson (winter ' 97). Here is a more detailed portrait that shows his significance. When a great man, who has almost become a living legend among pipe smokers, leaves this world, the time is appropriate for a review of his life and his significance in the pipe world. There are two different approaches for this purpose: You can look at the merits of the person in his surroundings or you can look at the movements and development in the surroundings that made his merits possible. Both approaches will be used in this retrospective article. The story of Sixten's entrance into the pipe world has been told several times, a short version was found in P&T, winter 1997, so this article will just remind you of his entrance and then focus on his influence. World War II - no English Pipes. Sixten was born in a very poor family in Skaane (Southern Sweden) in 1910. His father died when Sixten was only 8 years old, and Sixten's mother had to provide for a family of 4 children. Any kind of education was out of the question. It was hard times with huge unemployment. The poverty he experienced in his childhood and youth influenced Sixten´s way of thinking for the rest of his life as we shall see. In the mid 30´ties he got married. Sixten and his wife chose to emigrate to Copenhagen, the capital of the neighbouring country, Denmark. Today it is just a one hour motorcar ride across the Oresund Bridge, but at that time it was two different worlds. Sixten´s Danish brother in law - married to Sixten´s sister Greta - had a small bill collecting firm and he asked Sixten to come and work as a bill collector. Sixten worked as a bill collector for several years. During World War II there was a shortage of everything, and he supplemented his income by making for instance needles for padding from old bicycle wheels at 1 cent each. In his spare time he worked a lot with different kinds of woods since he had always been good with his hands. During and after the war it was impossible get new pipes, which were all made in England (and France), and the old ones were frequently repaired. A fine collection of Sixten Ivarsson pipes from 4 decades. Shortly after the war, Sixten had made himself a pipe from the root of an elm tree. He went to a pipe repair shop (Suhr's pipe repair shop) to have a stem mounted. But fortunately the repair man was ill for a long period. Sixten offered to fix his pipe himself, but first he had to fix the lathe which was out of order. He fixed both so well that right away he was offered work as a repairman. For some years he repaired countless numbers of pipes. Later he said that in this period he learnt all about how pipes should not be constructed. Before the real (English) pipes were back in the market, it was possible to buy briar, possibly from France. One day a customer came into the shop with a pipe in his hand asking if they could get him another pipe like this. Sixten answered that it was impossible to get the original pipe but he was able to make a copy. The customer was satisfied with the pipe that Sixten made, and Sixten was now both repairman and pipe maker. The first shapes that he created were not far from the classic, traditional English shapes, only a little more slender and with angles that were not always 900 for a billard. The rumour was soon spread that at Suhr's it was possible to get new pipes and even in a somewhat different design. The price was relatively high, but there were no proper alternatives in the market. The rumour even reached Kyringe . In this small village in the countryside, Poul Nielsen considered how the factory, Kyringe-piben, was to be carried on and developed, now that war was over and briar was accessible. The factory was started during the war and produced charcoal of beech wood. The charcoal was used for generators on vehicles since gasoline was very much in shortage. The factory also had a small secondary production of pipes, also in beech wood. 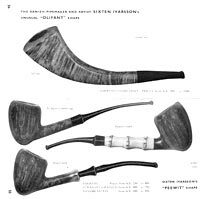 When Poul Nielsen one day visited Suhr's he immediately fell for Sixten's pipe shapes to be used for his own machine made pipes, now called Stanwell. This became the beginning of a long and fruitful collaboration that lasted for more than 4 decades. In Stanwell's first regular catalogue at least the first 10 shapes are creations from the hand of Sixten. A precondition of this was that Stanwell had bought their first copy fraisers in 1948-49 which were able to copy Sixten's shapes. The collaboration with Stanwell lead to the independence of Sixten - as the first individual pipe maker/carver in Denmark. Sixten had a disagreement with the owner of Suhr's about the sharing of the royalties that Stanwell paid for the use of Sixten's shapes. Sixten's place as foreman of the workshop was taken over by Poul Rasmussen, who has also had an impact on the development of Danish pipe making culture, but that is another story. Typical post-war Sixten Ivarsson shapes from end of 40’s and beginning of 50’s: Classic English shapes like Zulu and Dublin, but more slender and slim and slightly different curves. - The perhaps most important idea behind functionalism was that the object was supposed to work and function as intended. Sixten said that a beautiful pipe was okay. But if the pipe was not a perfect smoking instrument - meaning for instance correct drilling of tobacco chamber and smoke channel, a comfortable bite, good balance and proportions - it was all the same. The years of repairing pipes had indeed taught Sixten how pipes function perfectly. - Another important idea in the functionalistic/functional design of furniture was that the material was the starting point, meaning accepting the nature and character of the material in question and then trying to make the best out of it according to the purpose. As a parallel to this idea Sixten began to work more with the grain and the staining. The fact that the pipes were handmade allowed him to turn the blocks of briar to get the most beautiful grain before carving the shape. Likewise the shape of the pipe could be changed during the process if a big flaw in the wood showed up. On the other hand, Sixten always accepted minor flaws in the briar if they were inevitable and did not do much to try to hide them. How about leaving this top on the bowl and thereby get a new and decorative element in the shape. This had not been seen before, at least not in a Danish pipe. With this shape Sixten had created a "forerunner" for all the many Danish free-hands with a rough-top that were to become very popular in the 60'ies. Sixten called this pipe The Unfinished. Sixten had carved one of his typical, long and slim shapes in straight grain. Unfortunately, there was a very dull grain in the briar at one side on the top of the bowl, spoiling the total impression of the pipe. Sixten found the solution to this problem when he saw a bust of Nefertete, the ancient Egyptian queen with the slant head, mother in law of Tut-ankh-Amon. Sixten cut off the dull part in an 45 0 angle, thus creating a new shape, Nefertete. It can also be found in old Stanwell catalogues. - A third similarity to the functionalistic ideas was Sixten's development of his shapes in the 50'ies. The shapes were basically very simple; very often classical, traditional pipes given a slightly different curve or angle leading to lightness and elegance. A good example was Sixten's favorite shape all his years, peewit, which is simply a bird's egg mounted with a pipe shank and stem. In Denmark we call this shape a lap-wing's egg. - A fourth similarity was the use of new materials for the pipe shanks. The designers of furniture had begun to use steel, glass and new kinds of wood, while Sixten began to use bamboo, buffalo horn and bone for many of his shanks. I have discussed with Sixten's son Lars why Sixten did so. We have come up with two possible explanations, both showing Sixten's economical sense: As mentioned before it was very difficult to get briar blocks after the war. So to get the most out of the blocks of briar, Sixten turned or carved 2 or 3 bowls out of a block, whereas other pipe makers were only able to get one bowl out of the block. On the other hand the shanks would be rather short, and it was natural for him to prolong the shanks using another material to get a shape of the right proportions. Another possible explanation was that Sixten hated to see anything being thrown away and wasted, raised under very poor conditions as he was. Sixten once told me that each time he visited the Stanwell factory, he looked in the baskets with rejected bowls that would otherwise be used for firewood. Very often he found bowls which he could get something interesting out of by his handwork in his workshop, for example bowls with broken shanks. - Finally the functional furniture designers and architects had the idealistic idea that their work should reach out to and be used by ordinary people, not just the elite. One could say that Sixten was following that same idea when his new modern shapes were being used by Stanwell to make machine made pipes affordable by anyone. He also helped the factory several times, solving specific problems. For instance he taught them to make a nice bamboo-shank. I think you can say that Sixten's breakthrough in a functionalistic environment was a matter of the right person at the right time. Rounded Billard with bamboo from 50’s. The egg shape with bamboo and horn. 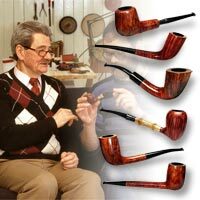 These three pipes are classic Ivarsson shapes which he made for more than 40 years. The two bamboos are from 1982 and 1987. Many of Sixten Ivarsson´s shapes changed over time but not the egg shapes. Sixten ones told that the demand for the egg shapes was so big that he could have carved nothing but egg shapes all through his career. A squat ¼-bent from end of 50’s. Sixten Ivarsson's Development as a Pipe Maker and Pipe Master. In the beginning of the 50'ies, Sixten had established himself with his own workshop. It was still hard work to make a living. After the break with Suhr's he still repaired broken pipes, he made his own pipes and sold them to a Danish wholesaler, he created new shapes to Stanwell and he sandblasted all Stanwell's sandblasted pipes until they acquired their own machinery. As mentioned before his shapes were in the beginning not far away from the classic shapes, since they were "only" supposed to be replacements until the English pipes were back in the market in Denmark. During the 50'ies Sixten develops his shapes further. In Pibe-Dan's catalogue from 1958-59 for example, you can find a ukulele shape made by Sixten, close to the ukulele that Tom Eltang makes today. A very important innovation was the free hand pipe and the techniques to carve it. • A "frasing" (duplicating) machine cuts each block of briar by copying a master pipe, making a series of copies exactly the same shape as the master piece. This machine method is traditionally used by the production oriented pipe factories. • The pipe bowl is cut (turned) by the pipe maker while spinning on a mechanical lathe. 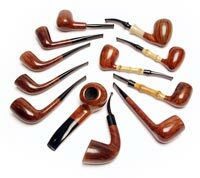 A good experienced pipe maker can repeatedly make almost identical shapes. When blocks are turned mechanically they will naturally become symmetrical round shapes (circular bowls and shanks). The blending of bowl and shank is usually formed by mechanical sanding, and the final surfacing is done with sandpaper. Until about 1957 all Sixten's shapes were made like this. • The freehand pipe bowl is mainly formed by holding it in the hands against a powered sanding disc with some kind of vacuum to remove the unhealthy sanding dust. This gives the artisan pipe maker a better opportunity to follow some of the grain of the briar and to even make sculptural asymmetrical shapes. The tobacco chamber is bored and the air channel is drilled in hand after the pipe has been shaped. This last method or technique of creating and sculpturing pipe bowls was new; and Sixten was the first to really design and make corresponding pipes in this way. In the same catalogue mentioned before, you will find Sixten's first entirely freehand shape, an Oliphant, carved by many artisans since then, but this one was also squared and therefore impossible to cut on a lathe. After that Sixten used a mix of techniques when shaping his pipe bowls. The free hand pipe was something completely new and soon became very popular, especially with the rough bark left on the top of the pipe. During the 60'ies several pipe factories and workshops were established, producing large numbers of semi-handmade free-hand pipes of very varying quality. For a period the USA was flooded with these fancy-pipes. But that is yet another story. During the 50'ies several other pipe makers began to carve their own individual handmade pipes. In Suhr's Poul Rasmussen began to carve nice classical pipes. Gert Holbek who had been apprentice with Rasmussen became independent from 1955 and has since then carved pipes in his own very personal style. He is still making a few pipes. Arne Nygaard made pipes for Pibe-Dan and Brakner made pipes with a very characteristic rustication. In Jutland, Viggo Nielsen had been working with pipes since the war. The tobacconists W.Ø.Larsen and Pibe-Dan specialised in high -grade pipes and published their first catalogues in the end of the 50'ties. Both catalogues were in English. In the beginning of the 60'ies, Sixten began to have pupils. From an early age his son Lars earned his pocket money in the workshop, first by sweeping the floor, then by repairing pipes and finally by making his own pipes. Lars graduated from school of economics with a degree, but pipe making won over economics. (About Lars, see P&T vol. 1 no. 4). Later came Jess Chonowitsch (P&T vol. 2, no. 3) and Jorn Micke (who is almost unknown, except in Japan). They are all known to make very high grade pipes. Bo Nordh from Sweden, perhaps the perfectionist above all perfectionists, gained much inspiration from Sixten. He developed his shapes from classical pipes of less interest into fantastic free hand shapes through his acquaintance with Sixten, who still had Swedish citizenship. Finally Lars' daughter Nanna assisted Sixten in his workshop late in the 80'ies and in the beginning of the 90'ies, especially with the stages of process that need a good eye sight. She also learnt to carve her own pipes, but has now chosen to become an industrial designer. In these pipe makers´ pipes you can see a clear similarity with Sixten's shapes, especially in their earlier pipes. Today the pupils of "Sixten's school" have developed their own style, but the relationship to the master's style can still be seen. During the 60'ies Sixten makes new shapes again. He is still making his now classical Sixten Ivarsson shapes - the egg shapes in particular - right until the end of his pipe making career. But the flower-power style of the later 60'ies -spreading to every kind of design, furniture, clothes and interior decoration, also hit many pipe makers. Most pipe shapes became softer, more sculptural, organic and asymmetric. This was true for Sixten as well as his pupils. Later on in the 70'ies and 80'ies the pipes returned to more tight and less organic shapes. The following short quotations, which I have from his pupils, show a part of his personality: Sixten was known to strongly emphasise perfection. He always said:" The pipe must be perfect. It has to be like this so that the next stroke with sand paper will reduce the quality of the pipe". He also told his pupils: "You have got to have an idea when you sit down to make a pipe. If you haven't got an idea, it is all the same." On the other hand he recognised the skills of his pupils and their need to experiment with their own shapes. He said: "It is a bad master that does not allow his pupils to become better than himself!" Pipe makers Lars and Nanna of course, Jess Chonowitsch and Jorn Micke, Per Hansen & Ulf Noltensmeier (S. Bang) and Tom Eltang, all among the upper class of artisan pipe makers in the world, from Stanwell: Managing director Jens Lillelund and foreman Arne Dehli and finally the author of this article as a "pipe fan" and "pipe friend"
When Sixten started at Suhr's Pipe Repair Shop, a pipe maker was a more or less unskilled worker like a navvy or factory worker. When he ended his career, a pipe maker was considered an artist in his field performing highly admired artisan work (e.g. like a silver smith) that sold at sometimes incredible prices. With his ideas of the perfect pipe, Sixten made a great difference in this process. On the other hand he always kept both feet on the ground and never made a big thing out himself and his pipes. He was very often seen with a warm subtle smile on his face. Some of the young pipe makers claim that it was because he constantly wondered why anyone would pay such outrageous prices for a piece of belaboured and manipulated wood with a bit of black hardened rubber. In the beginning of the 60'ies Sixten was well established and had a number of regular customers. 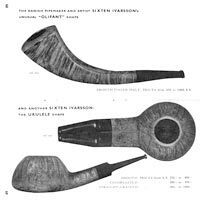 The two catalogues (in English) from the leading pipe shops in Copenhagen (Larsen and Dan) both had Sixten pipes, and the catalogues aroused a beginning American interest. An agent from Marshall Fields became Sixten's first whole selling customer in the US, but the perhaps biggest retailing tobacconist in the World, Iwan Ries in Chicago soon became Sixten's customer. From about 1965, Ries had the sole agency of Sixten's pipes, and Sixten was most often the top pipe maker of the catalogues from Ries. Up till the 1981 catalogue you will find Sixten's pipes, and the prices run from 300-600$ for an ordinary Sixten Pipe, right up to 3000$ (in 1978) for the most extraordinary shapes. Stanley and Elaine Levy who ran the shop at that time (before Chuck Levy took over) travelled a lot in Europe to buy the pipes directly from the pipe makers and thus got personal relations with Sixten. Mrs. Elaine Levy, who is in her mid 80s now, remembers that Sixten was very fond of her and the Levi visits in Denmark. He had made a necklace for her from pretty pieces of rock washed on to the shore near his house, including apricot pits that he had sanded and polished on his buffing machines. Sixten carved his last pipes in 1993-94. Many wonderful Sixten Ivarsson free-forms from the end of the 60’s  these are very organic and asymmetrical - and a few “neo-classic” Sixten Ivarsson shapes. These beautiful photos are from a Japanese pipe book from 1971. These are two short anecdotes about Sixten from around 1960 coming from an old English-teacher who was a customer in Sixten's. work shop. They clearly show how proud Sixten was of his craftsmanship. The first anecdote describes how Sixten showed a large collection of his pipes to the teacher, when an obviously very busy gentleman came rushing in the door and wants to see some pipes. "I am sorry. I haven't got any," Sixten answered, and the gentleman had to leave without having accomplished his purpose. When he had left, the teacher asked Sixten:" Why did you say that? You could have sold several pipes!." Sixten answered,"Did you see his pipe? - sour and maltreated! And a pouch of Mac Baren's Mixture sticking up from the pocket! He is by no means going to smoke any of my pipes!" The other anecdote is about Sixten selling one of his famous sandblasted bamboo pipes to the teacher. The pipe must have been looking a bit fragile, because the teacher asked: " Are you sure that the pipe will hold?" Sixten replied by throwing the pipe up in the air and letting it drop down on the floor. He bent down and picked up the pipe and handed it over to the highly surprised teacher with the words, "Yes I am, but don't let this become a habit!" After Sixten became independent, Sixten's pipes were always stamped with "an Ivarsson product", written in a ring. Lars' and Nanna's pipes carries the same stamp, but can always be identified by their initial letters or names on the pipes as well (L.I. and N.I.). According to Lars, until about 1965, Sixten also stamped his pipes with at least 2 figures inside the ring. The first (one or two) figure(s) was referring to the price. When he started, the cheapest pipe cost 35 Danish kroner (about 5 $). This was marked with a 1-figure. From 35 dkr. the price was added by 5 kroner for each step (40-45-50-55....) and the figure was added 1 for each step. The last figure was referring to the year of production starting from 1950. So a pipe stamped 55 cost (35 + (5X5)) = 60 kroner and was made in 1955. Pipes sold to the USA were often stamped with a figure outside the ring referring to the bill on which the pipe was included. I guess Sixten could not imagine the sky high prices for his pipes later on, when he created his system of stamping. From the middle of the 60'ies, he just stamped the year, e.g. 1982. Jakob has been writing a lot of articles to the Danish magazine Piber & Tobak since the 80's. He also worked for 10 years in the famous pipe shop Pibe-Dan while he studied at the University. Pia Dan, Niels W.Ø. Larsen, Jens Lillelund, Lars Ivarsson, Jess Chonowitsch, Michael C.G. Iversen, Elaine and Chuck Levi and Rex Poggenpohl. This article was written 5 years ago in 2001 when Sixten died. I tried to have it published in Pipes &Tobacco Magazine, I didn’t succeed. But now it’s out in cyberspace and I am very pleased. Sixten’s last pipe was carved in1995 for Mr. Rick Newcombe who also reminds me that Nanna Ivarsson is back in pipe business making pipes. Nanna is Sixten’s Granddaughter and Lars Ivarssons’s daughter. She studied with Sixten in his last years making pipes and helped him with small details that needed good eyesight Sixten’s eyesight was not the best at the end of his carrier. I remember him sometimes wearing two pair of glasses at the same time in is workshop. 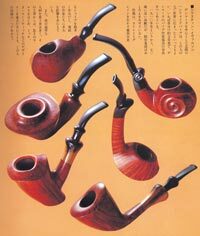 While talking of students I forgot to mention Sixten’s impact on Japanese pipe carving. Several Japanese makers visited Sixten’s workshop and stayed for days and Tokoutmi even stayed for a month. Bo Langer adds to the nomenclature that an X stamped in the shank inside or next the other stampings means that the pipe has been replaced, for example because of a burn out (which happened very seldom). Bo also tells me that Sixten did not really like to work with gold which he found to soft compared with silver. This is why Sixten Ivarsson pipes with a gold ring are very rare while silver rings are found more often on his pipes. An American came into the work shop and bought an expensive pipe. He said to Sixten: You must be a rich man. Sixten answered him: I am very rich... and I have a little money too. Finally it comes to my mind that ironically The Grand Old Man of Danish pipe making kept his Swedish citizenship all his life (like Lars has done too). Sixten was buried from the Swedish Church in Copenhagen. I will like to thank Dmitry Andreyko from the Moscow pipe club for his effort and look forward to other joint ventures for the benefit of all our Russian visitors.